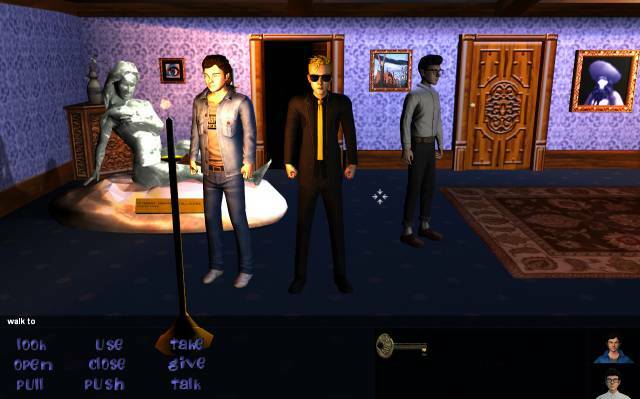 As the name says: a remake of the mother of all adventures Maniac Mansion in 3D, with Ankh / Jack Keane like graphics. We made this game to learn how 3D Gamestudio works and to use this knowledge for our first own project. yeah nice. Especially the image with the reactor in the pool remains me on restless nights in my youth. We stay very near to the original, with some minor changes wich will give the game a more modern kind of gameply expiriance. The Puzzles will stay the same. Pegamode will soon, post some interesting fakts about the games tech. Here come some technical information about this project. First of all we implemented a generell adventure system for A7 to do everything that SCUMM does for Maniac Mansion. We call it simply GAS (Gamestudio Adventure System). Currently the game scripts are finished at 90%. All possible walkthroughs can be played until the showdone when the player enters Dr. Fred's laboratory. We have over 300 useable objects the player can interact with. We did also some changes in comparison to the original Maniac Mansion to get more realism and get lost of some unlogical parts of the game. All those changes don't change something on the base of MM as we like to be as close as possible to the original. real conditions. If it could ever be published (of course for free) depends on Lucasarts as they still have the rights on Maniac Mansion. I think there is much more to mention, but this should be all for this time. *tears*, looks and sounds great, that should have took alot of time and should have been alot of work. Yeah, the lights are just... incredible. Now I really know that I won't switch to Unity. We started about 2 years ago, but had also some months where we didn't find the time to do anything on this project. As all team members have full time jobs and family there's just some short time every day or week for this project, but as you can see the progress never stopped and we hope to have a final version (without speak-package) in the beginning of the next year and hopefully a speak-version in summer 2010. During those 2 years we learned much about Gamestudio and A7 got a lot of new functions so that we had to refactor the scripts regularly. We're lucky that the GAS concept works very fine and with the GAS as base we can build our own adventures in future very easily. One thing has to be mentioned ... the screens are all beta and characters, textures, lights, models and so on are currently all in fine-tuning progress. So all graphics will be (hopefully) optimized soon and it seems that we can get a high fps even on non-today pc hardware (I have nearly constant 60 fps on my lenovo T60 laptop where the gfxcard is not really good for games and we still have space for optimization that raises fps). this is very cool. I worked on an art prototype for a adventure game to be made using gamestudio for university which i finished a few weeks ago. great to see others working on adventures too. so once this is done are you guys looking at commercially releasing your own title? one thing, which you said above, is the art is in it's beta stage. if you were to release your own title, do you reckon you'll have voice acting and very stylistic graphics like the new monkey islands or a vampyr story? We plan to create our own title as soon as we have finished this current project. If everything works as planned even Maniac Mansion 3D will get voice acting.